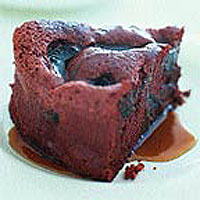 Brandy steeped prunes in a moist chocolatey sponge make this a superb dessert you can prepare ahead for any occasion. Serve it cut into small wedges, with the coffee syrup. Place the prunes in a small bowl and spoon the brandy over the top. Leave to soak for about 2 hours, or until the brandy has been absorbed. Preheat the oven to 190°C, gas mark 5. Line the base and sides of a 20cm spring-form cake tin with baking parchment (see Cook's tips). Place the chocolate, cocoa, 150g of the sugar and 150ml boiling water in a large mixing bowl. Stir until melted and smooth. Whisk the egg whites in a separate bowl until stiff. Gradually whisk in the remaining sugar. Sift the flour over the mixture and fold in gently using a large metal spoon until the flour is nearly incorporated. Stir about a quarter of the egg white mixture into the chocolate mixture until incorporated, then pour the chocolate mixture onto the remaining egg whites and carefully fold in. (This mixture will be very loose.) Pour into the prepared tin. Scatter the prunes over the top, then bake for 30-35 minutes, or until the sponge is just firm and has risen up around the prunes. Leave to cool in the tin - it will sink a little as it cools. While the cake is cooking, make the syrup. Place the coffee and sugar in a small, heavy-based saucepan with the lemon juice and 150ml cold water. Heat gently until the sugar has dissolved. Bring to the boil and cook for 3-5 minutes, or until thickened and syrupy. Strain through a tea strainer and serve spooned over the cake. To make the baking parchment adhere to the edges of the tin, brush with cold water rather than oil or butter. Sweeten Greek yogurt with a little icing sugar and serve a spoonful with each portion - the dessert will still be Perfectly Balanced.